Stefano and I are supposed to be on "1 week vegetable diet", but yesterday night I have decided to prepare something new that hopefully wasn't too unhealthy.. Do you think I've succeded? ..at least they're oven baked! Boil some water and pour it in a bowl over the couscous and 2 stock cubes. The water should cover the cous cous completely (if it is not enough, then you can add it later but remember: if you pour too much water, it won't be absorbed by the couscous). Mix everything together until the cubes have melt and combined with the couscous. In the meantime, pour some olive oil in a pan and mix cooked spinach with onion and parmesan cheese-- pre-heat the oven at 350F/200C. Mix the couscous with the spinach and 2 eggs. Now you can start preparing your bites. You can decide how big you want them, mine were big enough and I came up with 20/25 of them. (suggestion: if the mixture is too watery, squeeze the ball in your hands in order to take out the liquid in excess). 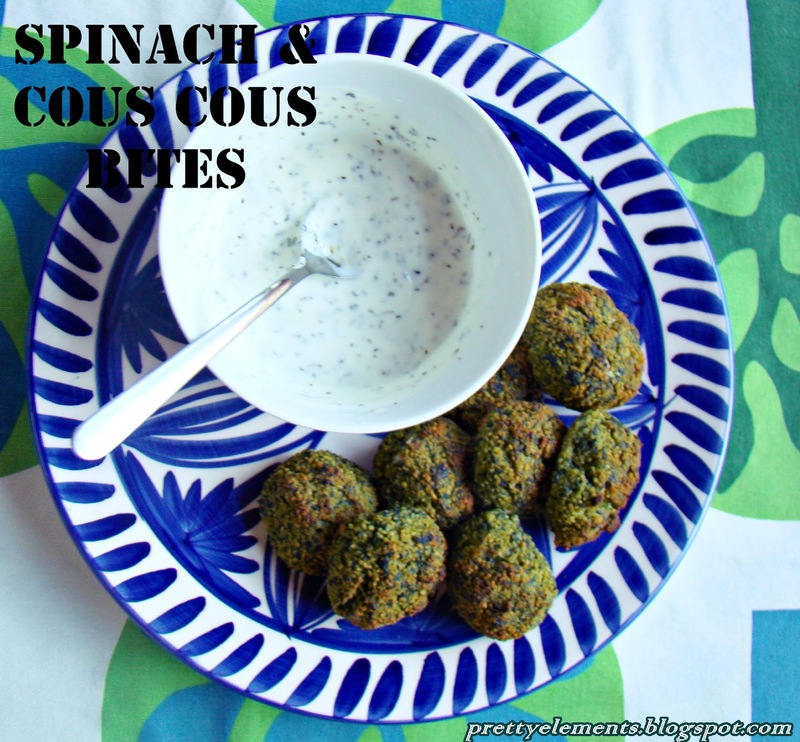 Place the spinach and couscous bites in a baking tray and bake them for 15/20 minutes. Combine 1 cup of greek yoghurt (light!) with 1 spoon of olive oil, a pinch of salt and chopped mint leaves. These look good--I wonder if I could substitute cooked kale for the spinach. I have a big bag of kale from my farm share. These look delicious! I've pinned them to try sometime! I just love this! I have been on the lookout for healthy snacks and these are perfect. :) Pinning right now. Thank you so much for linking this recipe up at Tasty Tuesdays - hope the rest of your week rocks!! Thank you!! Will share some other healthy snacks later on today ;) Have a nice weekend! I LOVE the idea of these being bitesized! :) Perfect for snack time or for on the go! Thank you so much for linking up with me this week at Tasty Tuesdays! I’ve pinned this & shared it with my followers! Please be sure to stop back by the party and check out some of the other links! Thank you! I'm glad you've liked them :) Have a nice weekend! These are so cute and healthy! I love anything with spinach and I am currently on a couscous kick, so this is perfect for me. Thank you! I hope you'll enjoy them as much as I did :) Have a great weekend!